So… The Legal Genealogist knows it sounds like a broken record sometimes. To understand the records, we have to understand the laws at the time and in the place where the records were created. Which is why I keep stressing that we have to go back and understand English common law as well as the laws created here in the United States. Because we didn’t just inherit a legal tradition from the English. We adopted huge chunks of English law, lock stock and barrel, both in colonial times and as we became states and joined together as a nation. Poking through some Tennessee statute books as I prepared for this weekend’s seminar with the Tennessee Genealogical Society,1 I came across a really clear example of just what I mean here. 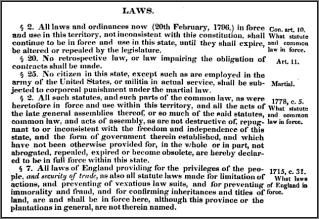 It’s set out in a section entitled “Laws” in an 1831 collection of the laws of the then 35-year-old State of Tennessee that included the colonial and territorial laws that continued in effect at that time.2 And there are three key provisions that tell the tale. And what did the laws of England consist of at the time? Oh, there were statutes galore, for sure — passed by Parliament, approved by the monarch. But then there was the common law. So many concepts of basic law that — through this language — came into the law of what became Tennessee. But, you might think, surely we threw that away later and went our own way at the time of the Revolution! And in part we did. But not completely. See? We still followed English common law and made it part of our law, unless it undermined our new-found freedom or we specifically said otherwise. Oh, but of course Tennessee would have done its own thing, so to speak, when it became a state, wouldn’t it? And that, my friends, is total incorporation of English common law into the law of the new State of Tennessee, to the extent that the legislature hadn’t — then or thereafter — said otherwise. And that’s why we need to know what the common law was — because it was and is a common element of our legal heritage. It informed and controlled the actions of our ancestors and the decisions of the courts and authorities they dealt with every day.